Nepal: Please Join my action to raise money for people sleeping rough in Nepal following the devastation of the Earthquake. Please donate just 10-30 GBP/ 15$ to 45 $ Why not take 2 min to do it now? Learning Alias sponsors the Education of children in Nepal. But right now we need to raise money quickly to send to her village Khiji Chandeshwori, which is in the foot hills of Mount Everest. 7 homes in this small village 2 days walk from the nearest road, have need completely destroyed and the families are sleeping under plastic in the rain and cold. However much is collected up to 1000 GBP ,LearningAlias will double. Thank You for your kindness, graham bullock. before throwing myself into Learning Alias. I had been employed as a clay modeller for many years and had the opportunity to get to know Digital Modellers and find out first hand what various Platforms could offer and apart from what I learned from the many Digi/Modellers I worked along side, I also did my own research, in order to determine which platform would offer the best career. I looked in depth at Rino, ICEM and Alias. My research covered all aspects, including earnings potential, number of available jobs, degree of surface quality possible + other potential, such as visualization tools etc. I soon came to realize that Alias is regarded world wide as, the best platform on the market and is used by most of the top OEM’s. The world has been through 2 major recessions since the start of my Alias career, including the current global economic crisis and there has never been a time when I have been without work. Right at this moment, Alias modellers are in demand all over the world by companies offering top rates. Hi I’m Kevin De Smet advanced student at LearningAlais. I want to talk a little about the advantages of Alias over Rino. Rhinoceros is an interesting product for consumer product design on a budget, because it shares many similarities to Alias in the way that you work and all that at an affordable price. Compared to Alias Design which runs around 4000$, Rhino is approximately 1000$. The team who developed Rhinoceros knew they wanted to democratize surface modeling, just like SolidWorks did for solid modeling. Their motto was: “less profit per seat sold, just sell a whole lot more seats!” Rhino does not offer the level of quality and precision as Alias Surface or Alias Automotive, but the pricing is worlds apart between the two as well! Are you looking to be a freelancer, or join a company? In the case of the latter, pricing is not going to be your concern. 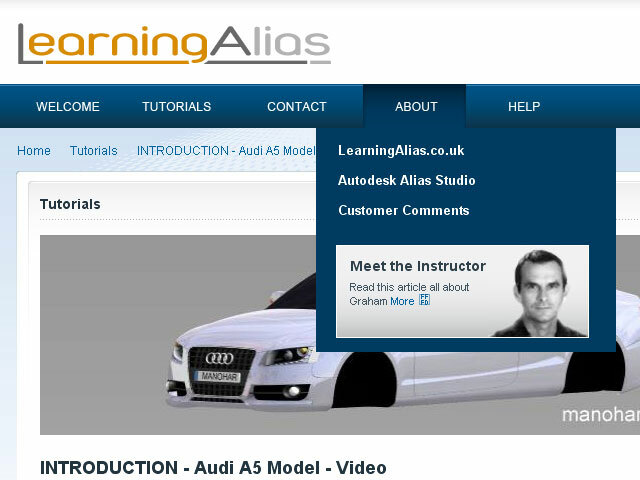 And I’d strive to learn the best, which is Alias Surface or Alias Automotive software. NX is the only remaining competitor to CATIA, fully featured solid modeling system and with a similar price tag to boot! I think in terms of surfacing, NX has some interesting technologies you will find some videos on YouTube I believe. However, between the two I have more faith in CATIA Icem. If Dassault ever gets their act together on that one! SolidThinking I would avoid. It shows some promise, maybe. But as it is today, it is a product that fails to deliver in my opinion. Kevin De Smet (Advanced student and resource creator at LearningAlias). We are flat out at learningAlias both with meeting our personal modelling deadlines and with reviewing our students work. Any spare time is devoted to developing new learning materials and helping “Elite” students who have completed their learningAlias course to prepare their CV’s and digital portfolios, so that they can set off on the task of finding themselves a good Entry level Automotive contract. For these reasons we simply cannot respond to questions sent in by non-subscribing students, however Kevin de Smet has kindly agreed to make an exeption and answer the following questions. If you are not a subscriber, the correct place to ask your questions is on the Autodesk Alias Modelling forum. I would like to thank Kevin for making time to answer this particular set of questions. 1- How can we draw precisely in Alias design, like parametric software (Solidworks etc.)? 2- How can we give thickness to surfaces and make them solid? 3- How can we use the output of Alias design for technical drawing? Graham has asked me to make time to answer your questions. As for your first question, how to draw precisely in Alias, is a really good question. I had the same question when I started out. The thing is, there actually aren’t that many “dimensions” on a car body. Nor are there that many prismatic shapes (i.e. planar, cylindrical, etc…) because every shape blends into the other, they all have subtle influence where one shape stops and another begins. Even if it looks almost like an analytical form at times! To describe that shape, is freeform. And we use nurbs surfaces to do that, defined by control vertices. That’s it, no more. Now, there is something that may help you out, if you go to Window > Palette and open up the Curves tab then use the “kptbx” tool. It opens the Keypoint Curves box which allows you to draw analytic shapes, if you draw for example a line you can select it like any curve and go to Windows > Information > Information Window, open up the Attributes and you can key in a numeric value. Now there is no constraint solver in Alias, like in SolidWorks you can make lines parallel to each other or tangent etc… but you can use the Align tool for this, it’s under the Object Edit tab in the Palette. Your second question is one of thickness, this is more complicated than one would think. Usually thickness is given when the data is passed over from Alias to the solid modeling tool (CATIA or NX) you can give a thickness in Alias by using in the palette Object Edit > Offset but why this is not preferred is that this does not create a true offset surface. It’s just another surface with control vertices, no more. And it merely simulates being offset. In the solid modeling tool it is a procedural surface explicitly defined mathematically as offset. It’s a subtle difference, but it’s a pretty big deal! I do think Alias handles an offset differently if you stitch your model first using Surface Edit > Stitch. But it’ll never be quite like a solid modeler can crank out offset geometry. Thirdly, Alias does not have a drafting environment as you would know it from SolidWorks. Typically the Alias data would be transferred over to the solid modeling engineering tool and the drawings are made on that system. During the past decade it’s become pretty popular to annotate the 3D model directly in the solid modeling system with 3D PMI (Product Manufacturing Information) with dimensions, text, surface finishes, geometric datums and modifiers all as per ASME Y14.41-2003, you should definitely look that standard up on Google! it’s, pretty cool. In the end it will require practice but things will start to make sense as you go through. 167 GBP for 6 months website access. This is the most economical way to access my unique Alias Automotive videos, where you will learn how to build the Audi A5 Sportback. You will also gain access to the many videos on Alias Pro. technique.